The igPieChart control is a HTML 5 jQuery Chart based on Infragistics Silverlight Data Visualization xamPieChart™ control. Further information regarding the classes, options, events, methods and themes of this API are available under the associated tabs above. The following code snippet demonstrates how to initialize the igPieChart control. The value provided should be an array of css color strings. Optionally the first element can be a string reading "RGB" or "HSV" to specify the interpolation mode of the collection. Determines how much the exploded slice is offset from the center. Value between 0 and 1. Gets or sets the collection of exploded slice indices. Should be an array of integers that indicate the indexes of the slices to explode. Gets or sets the function to use to transform a pie slice data context into a label for the slice. Function takes one argument of type object. Use context.item to get the item associated with the slice, if any. Use context.actualItemBrush to get the brush used to paint the slice. Use context.outline to get the outline brush used to paint the slice. Use context.itemLabel to get the label object that would be used for the slice. Use context.percentValue to see the percentage value that is associated with the slice. Use context.isOthersSlice to tell if the associated slice is the others slice. Should return a string value that should be used for the label. The height of the chart. It can be set as a number in pixels, string (px) or percentage (%). No labels will be displayed. .
Labels will be displayed in the center. .
Labels will be displayed inside and by the edge of the container. .
Labels will be displayed outside the container. .
Gets or sets the margin between a label and the end of its leader line. Can be any valid options accepted by $.ig.ChartLegend, or an instance of an $.ig.ChartLegend itself. The name of the element to turn into a legend. Gets or sets a style object that can be used to override the style settings on the others category slice. Data value is compared directly to the value of OthersCategoryThreshold. . Whether the chart should render a tooltip. Gets or sets the rotational direction of the chart. Overrides the style used for text in the pie chart. The width of the chart. It can be set as a number in pixels, string (px) or percentage (%). Use ui.slice to get reference to slice object. 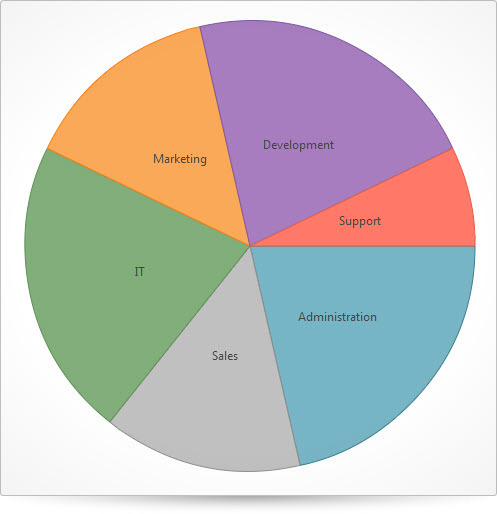 Use ui.slice.item to get reference to current pie chart item. Use ui.slice.isExploded to get is the slice exploded. Use ui.slice.isSelected to get is the slice selected. //Use ui.chart to get reference to chart object. //Use ui.slice to get reference to slice object. //Use ui.slice.item to get reference to current pie chart item. //Use ui.slice.isExploded to get is the slice exploded. //Use ui.slice.isSelected to get is the slice selected. Use ui.item to get reference to current pie chart item. //Use ui.element to get reference to tooltip DOM element. //Use ui.item to get reference to current series item object. the new item that will be added to the data source. Exports the chart to a PNG image. Exports visual data from the pie chart to aid in unit testing. Returns the ID of parent element holding the chart. the new item that will be inserted in the data source. . Creates a print preview page with the chart, hiding all other elements on the page. The index in the data source that we want to change. the new item that we want to set in the data source. Returns the element holding the chart. Get or set the class applied on a div element, shown when the chart is opened in a non HTML5 compatible browser.